If a blade stops cutting all the way through on a material you have successfully cut in the past (and the mat isn’t too dirty), it’s probably time for a new blade. This Cricut card stock nearly always cuts beautifully, but I noticed some “hanging chads” on a recent cut. Sure enough, my blade hadn’t been changed in about a year. If I’m having to get my Xacto knife out more often to complete cuts, that’s a sign it’s time to change the blade. After changing the blade, no more hanging chads! Life gets busy, and I’ll soon forget when I last changed the blade. When I install the new blade, I write the date on a piece of tape and stick it to the back of the machine. If I get a “hanging chad,” I can quickly check to see if it’s been a while since I’ve changed the blade. When you change your blade, put the date on a piece of tape and stick it to the machine. A Premium Fine Point Blade typically lasts 9-12 months. If you are using a Cricut Explore or Maker, you need to buy the Premium Fine Point Blade with the red or white cap, NOT the Fine Point Blade with the gray cap. The Fine Point blade will fit in the housing, but the quality of the cuts will not be as good, and it will probably cut through the backing on vinyl. You can read more about which blades are for which machines here. 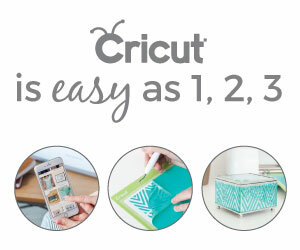 The cheapest place I have found to buy new Cricut brand Premium Fine Point blades is Amazon.